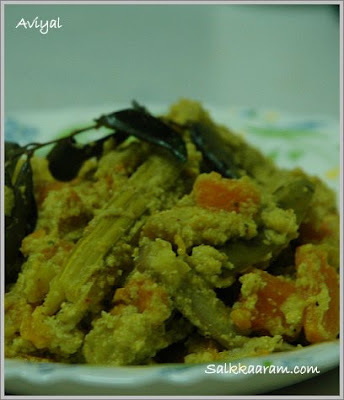 Avial Thrissur special | Simple and Delicious ! Once when I published my avial recipe in one of the famous cooking sites, I got a message from a reader that no one would add small onions in the avial! :) Yeah,We use small onions for making avial. So, this avial has a different taste than the usual one. In some parts of Trissur, small onions or chuvannulli are added to avial. You can make this one without small onions too..
1)Cook the vegetables with salt, powders and 1 tbsp of coconut oil. :- There is no need to add water if you have washed it just before cooking. 2)Grind together 1 tbsp of coconut, cumin seeds and curd, till it becomes smooth paste. 3)Add remaining coconut, green chillies, small onions and a few curry leaves and finish grinding in one or two turn. 4)Add enough salt and mix well. 5)Pour this solution into the cooked vegetables and just heat it through. :- Don`t cook too much. 6)Remove from fire before boiling. 7)Make a small hole in the middle of curry with a spoon. 8)Fill it with curry leaves and add the remaining coconut oil. 9)Cover it with the gravy. nice recipe seena, this is sowmya anilpillai from pachakam.com.Adding onions brings out a different taste in the mix.Even I got constructive comment abt avoiding curd as it creates bacteria and to add tamarind..
hi seena. am new to cooking. In any recipe, a cup measure....does it indicate a tea cup?? Prepared avial... what should I say? It was just perfect, the way I want it to be!!! I am so proud of preparing it... and so glad that you are my source all the time. My hubby liked it very much, when I packed the lunch, he took some more of it to share in office... can you believe this? Got the guts to prepare this today & I must say Thank You!! Came out perfect & tasts yummy!!! Keep the website going for people like myself who see 'cooking' as a huge burden.